I love the cave-like feel of this chapel and the way it harkens back to the worship practices of ancient Christians. Another stop on the tour features an entire church full of windows made from Kokomo Opalescent Glass Company’s glass. 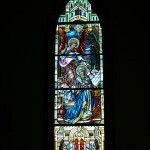 This church, St. Patrick’s, Kokomo, Indiana, has some absolutely beautiful windows. This article originally appeared in the Fall 2012 issue of The Stained Glass Quarterly. To download an Acrobat [pdf] version of this article in its original format, please click this link. One of the great things about being editor of this magazine is that, from time to time, I get to venture out of the office and visit some places with amazing stained glass. One of those trips happened in early September, when I got to visit Sts. Anne & Joachim Catholic Church in Fargo, ND. This was my first time visiting either South or North Dakota, and the drive to Fargo did not disappoint; I passed through some beautiful countryside in South Dakota and arrived in Fargo, just a short distance across the border into North Dakota, after dark. The next morning, I left before sunrise to be at the church in time for their seven o’clock daily Mass. The church was only an exit or two from where I stayed, and when I exited the Interstate and started east toward the church, I saw the silhouette of it immediately in the early light, looking as if it were right in front of me. What I did not immediately realize is that I was still more than a mile away from the church. Dedicated in 2010, Sts. Anne & Joachim Catholic Church enjoys a parish population of around 1,600 families. The church makes extensive use of marble and includes murals, bronze work, medallions, and, of course, stained glass. There is new glass by the Conrad Pickel Studio of Vero Beach, Florida, and repurposed stained glass from various studios. The overall liturgical design was by Liturgical Environs, PC, of Phoenix, Arizona, and was overseen by Fr. Brian Bachmeier, Fr. Paul Duchschere, and a committee of parish volunteers. The primary worship space is designed around a central plan in which the many decorative and teaching elements and the different areas of the worship space relate to one another: medallions on the floor relate to the stained glass above them; shrines and windows that face each other are linked. The steps of this central plan move around the nave’s center aisle and create a tapestry that weaves together many of the core elements of the fabric of belief important to the Catholic faithful. The journey begins at the God’s Creation and Baptism window, located in the choir loft opposite the sanctuary. This window unites a symbol representing God, with the themes of creation and baptism in an overall design focused on the goodness of God’s creation and on the goodness of man, created to the likeness and image of God. Creation and Baptism – This window is by the Conrad Pickel Studio, Vero Beach, Florida, and is installed at Sts. Anne & Joachim Catholic Church, Fargo, North Dakota. The pinnacle of this window makes reference to the Trinitarian reality of God, the source of both creation and redemption, with a triangle that represents the threeness of persons and a circle to represent the unity of divinity; an eye is incorporated into the design to represent the vision of God who watches over his creation, the Church, the parish family, and each individual. This symbol is encircled by Latin text that translates as “And behold it was very good,” which quotes Genesis 1:31 and is the statement made when God saw the entirety of his creation. Directly below this element is a presentation of the cross, the instrument by which God made salvation possible through his son, Jesus Christ. The themes presented below in this window speak to both salvation history and to the sacraments. The Creation segment, the left of this window and part of the Salvation History series of windows in the church, illustrates the entirety of creation, with Adam and Eve present as the summit of God’s creative act. They are surrounded by the Garden of Eden before the Fall. This segment reminds the viewer of the consequences of sin while at the same time speaking to the very positive themes of marriage and family. It is crowned by a round segment that illustrates Genesis 3:14-15, “The LORD God said to the serpent, ‘Because you have done this, cursed are you above all cattle, and above all wild animals; upon your belly you shall go, and dust you shall eat all the days of your life. I will put enmity between you and the woman, and between your seed and her seed; he shall bruise your head, and you shall bruise his heel,’” which prefigures the coming of Christ. While Creation depicts the beginning of the created world, Baptism depicts the beginning of the individual’s supernatural life. Baptism is the gateway to all of the sacraments, so it is very fitting that it should be shown in this first window, which is positioned directly above the main doors to the nave — the gateways to the church. This segment of the window depicts the baptism of Jesus in the Jordan by John the Baptist; a dove, a symbol of the Holy Spirit, descends upon Jesus amidst rays of sunlight, thus representing all three Persons of the Holy Trinity. In the foreground of this window, one sees a fish leaping in the water. The stylized Ichthys fish has long been a symbol with deep meaning to the Christian believer; this fish represents that tradition and reminds that the Christian life begins in baptism. Above the Baptism scene is an icon presenting a traditional symbol of baptism, a shell holding baptismal water and from which three drops fall, symbolizing baptism “in the name of the Father and of the Son and of the Holy Spirit,” the traditional and proper formula of baptism. Dividing the two scenes in this window is a tree. On the Creation side of the window, the tree appears as the Tree of Life, on which grows abundant fruit. On the Baptism side of the window, the tree becomes a weeping willow, symbolizing both Paradise lost and foreshadowing the passion and death of Jesus upon a cross. The Serpent is seen at the base of this tree, entering the Garden of Eden. It is through the temptations of the Serpent that sin entered the world, but it is through the waters of baptism that sin is forgiven. It is a tradition of the Church dating to the early Church Fathers that Adam, the first man, brought sin into the world through a tree and that Christ, the second Adam, overcame sin through the wood of a tree in the Holy Cross. The second stop in the journey around the nave of Sts. Anne and Joachim Catholic Church is before a window depicting Abraham and his wife Sarah. This window is above the Paternity Shrine and is a part of the church’s Salvation History series. Abraham and Sarah – This is part of the Salvation History series of windows. This window shows Abraham and Sarah departing Ur with its pagan shrines for the Promised Land, to which God will lead them. This event is foundational to both the Jewish and Christian faith. In the window, Abraham is pointing to the stars, which reminds us of God’s promise to make his descendants as numerous as the stars of heaven. The largest of these stars reminds the viewer of the Star of Bethlehem, which heralded the birth of Jesus and guided the magi to the manger. At the top of the Abraham and Sarah window is a round medallion depicting a ram being offered to God as a holocaust and reminding the viewer that Abraham was called to sacrifice his son – his only son – Isaac, upon whom fulfillment of God’s promise depended. Abraham’s faith was such that he followed God’s command, trusting in the Lord. Abraham was prevented from offering his son only after he had shown his willingness to follow and obey in complete faith. Abraham’s sacrifice prefigures the sacrifice of God’s own Son, Jesus Christ, on the cross. The three rays present in this medallion again symbolize the Trinitarian nature of God. Confirmation – This is part of the Sacraments series of windows. Above the neighboring Maternity Shrine and a part of the Sacraments series of windows is a depiction of the coming of the Holy Spirit at Pentecost, which calls to mind the sacrament of Confirmation. Just as the call of Abraham was the origin of the People of God, so, too, are the events of Pentecost the beginning of the age of the Church and the New Covenant in Christ with the people of God. Present in this window are the Virgin Mary and the Beloved Disciple among the apostles each crowned by a tongue of fire representative of the Holy Spirit. God’s presence is shown in both the rays shining down from above and in the wind depicted in the window. At the top of this window is a medallion that presents the descending Holy Spirit in the form of a dove over twin images of the Trinity, a triangle and three interlocking circles, which have been combined to form a single frame for the dove. This window, as do all in the Sacraments series, incorporates the chi rho symbol, which is an ancient christogram made from the first two letters of the Greek “cristos” (Christós, Christ) that calls to mind both the cross and Crucifixion and celebrates Jesus’ status as the Anointed One. Moses and the Exodus – This is part of the Salvation History series of windows. The next windows in the journey are above the Examination of Conscience Shrine and the Shrine of Nations. In the first, above the Examination of Conscience Shrine, is Moses and the Exodus, part of the Salvation History series. Moses is depicted holding the Ten Commandments, which are key today in many traditions of the practice of examination of conscience for the Sacrament of Reconciliation. Moses is leading the Hebrews through the desert and to the Promised Land. In the lower right of the window, depicted in the distance, are Egypt and the pyramids, which represent the slavery the Hebrews left behind. Also shown are many of the Israelites collecting the manna that they ate on their journey, and which as bread given from heaven prefigures the Holy Eucharist. Shown in the foreground to the bottom left of the window is a quail, which the Lord sent when the Israelites began to complain about eating only the manna. Two of the figures presented, seen behind and to the right of Moses, remind the viewer of Joseph and Mary, who fled to Egypt and were then called from there, after the birth of Jesus. The corresponding window in the Sacraments series is the Holy Eucharist window. In this window, Jesus is depicted following the post-Crucifixion journey to Emmaus with two disciples, to whom he explains the Scriptures and all that relates to the Christ. A scroll shown in the lower right of the window represents the Sacred Scriptures. Holy Eucharist – This is part of the Sacraments series of windows. The Scriptures report that the two disciples fail to recognize the Risen Lord until he breaks bread, which has always been understood in its context of the Breaking of the Bread at Mass. The window depicts the exact moment Christ vanished from sight, which is shown in the slight translucency of Christ in the window. The chalice and the bread are themselves encircled in a gloriole that reflects the nimbus encircling Christ’s head. This represents the Catholic understanding that, according to the words of Christ himself, the bread and wine become transfigured into the body, blood, soul, and divinity of Christ at the consecration. The next stop in the journey brings us to the window above the west confessionals. This window is an obvious fit for the Sacrament of Reconciliation as it depicts the woman guilty of grave sin washing the feet of the Lord with her tears in the home of the Pharisee. Her genuine repentance and humility is a striking contrast to the arrogance and hard-heartedness of the Pharisee. It is the woman, whose sins are forgiven, and Christ whose heads are crowned by nimbuses while the gossiping, judgmental, self-righteous Pharisees are not. At the top of this window is a medallion representing Peter, the first pope, who was given the Keys of Heaven and the power to bind and loose, from which derives the power to forgive sins in the person of Christ in the Sacrament of Reconciliation. King David – This is part of the Salvation History series of windows. Paired with this window is one in the Salvation History series presenting King David, who has realized how gravely he has offended the Lord through the death of Uriah and in his adultery with Bathsheba. This window presents symbols of wealth in the gold and jewels, of power in the king’s scepter, of violence in the bloody sword, and of lust in the black cat. The crown in David’s hand, recently removed from his head, is symbolic of David’s repentance and his recognition of his sinfulness and his unworthiness to rule as king, while the rays of sunlight are symbolic of God’s mercy and forgiveness. The harp represents King David’s love of music and calls to mind that tradition holds that many of the earliest psalms were composed by David. At the top of this window is a medallion with three symbols of divine kingship. The foremost is the crown of the king beset with three jewels that remind of the Trinitarian nature of God. Behind this are a crosier and the horn of anointing. Prophet Isaiah (detail) — This window represents the entire prophetic tradition of Israel and is part of the Salvation History series. Anointing of the Sick – This window is part of the Sacraments series of windows. Corresponding to this window is a window from the Sacraments series that represents the Anointing of the Sick, the sacrament that asks God for physical and spiritual healing. One of the main and recurring miracles performed by Christ was the healing of the sick; the window presents figures representative of people of all ages, races, and backgrounds coming to the Lord for healing and forgiveness. The window depicts Christ healing a lame man while many others also seek healing. Crowning this window is a medallion presenting a chrismaria containing the Oil of the Sick. The Holy Oils are made from scented olive oil, and so the chrismaria is entwined with an olive branch bearing fruit. Holy Orders and Holy Matrimony – This window is part of the Sacraments series of windows. A large window presents both the Sacrament of Holy Orders and the Sacrament of Holy Matrimony. This window is crowned by a medallion showing the Sacred Heart encircled by the words “Deus Caritas Est” (God is Love) at the top and “In Imago Dei” (in the image of God) at the bottom. The first is a reference to the nature of God, that of superabundant love, while the second is a theological statement of the nature of humans, who are created to the likeness and image of God. Smaller medallions represent (on the left) the Sacrament of Holy Orders, which is depicted by a book of Holy Scripture and by a chalice and host, which symbolize the two primary parts of the Mass: The Liturgy of the Word and the Liturgy of the Eucharist; while (on the right) the clasped hands of a husband and wife being blessed represents the nature of marriage as ordained by God and indissoluble. The Holy Orders section of this window depicts Christ, who came not to be served but to serve, washing the feet of his disciples on the night before he was crucified. The Beloved Disciple holds Christ’s outer robes while Peter is having his feet washed as the other apostles look on. On the table, three candles symbolic of the holy Trinity burn. Corresponding to this window in the Salvation History series is the Nativity window. The Holy Matrimony section of this window illustrates the Wedding Feast at Cana. The bride and groom are center in the window, and Christ is turning the water into wine, his first public miracle, as the Blessed Virgin Mary looks on. Also present are two doves, symbolic of the union of marriage. Present at the Lord’s feet and under the table at which the bride and groom sit is a dog, which reminds the viewer of Matthew 15:27. The final window in the nave is part of the Salvation History series and looks forward to the Second Coming while also commemorating the Nativity of Our Lord. This window relates to the Holy Orders and Holy Matrimony window in that the birth of Jesus represents the coming of God into the world for our salvation; Jesus hands on the responsibility of spreading the Kingdom of God to all of his followers, but in a very special way he hands it on to those in Holy Orders because those in Holy Orders are sent forth to teach and to serve. Second Coming and Nativity of Our Lord – These are both part of the Salvation History series of windows. The Second Coming window depicts Christ the King returning in majesty; the globe shown in the window is an illustration of the main building of Sts. Anne & Joachim Catholic Church, while, in the bottom right corner, we see Satan being cast out forever. Present are the trumpets of Revelation, as well as the scroll. The rays of light represent the Divine Majesty, just as do the descending rays from the Star of Bethlehem in the Nativity window. In addition to the windows described above, there are three smaller Conrad Pickel Studio windows near the baptismal font and two in the Paternity Shrine. These 16 windows were designed by the studio’s head designer, Lyn Durham. In addition to the Conrad Pickel Studio windows are additional windows throughout the church that were put back into service at Sts. Anne and Joachim after being acquired from Catholic churches that have closed. Worthy of special mention are the five windows of the Magnificat Chapel. The five windows of the Magnificat Chapel illustrate the five Joyful Mysteries of the Holy Rosary of the Blessed Virgin Mary: the Annunciation, the Visitation, the Nativity, the Presentation of the Child Jesus at the Temple, and the Finding of the Child Jesus in the Temple. These windows dating from the 1920s are by Otto F. Andrle Stained Glass and Art Company; they were originally installed at St. Matthew’s Roman Catholic Church, Buffalo, New York, which closed in 1993. Annunciation — from the Otto F. Andrle windows of the Magnificat Chapel. Otto Andrle operated his stained glass studio for 16 years after a career as a vaudeville musician and theater actor. Andrle frequently worked his signature elements of a hat and cane into the design of a set of windows, and these can be easily spotted in the Magnificat Chapel windows. Andrle frequently worked his signature elements of a hat and cane into the design of a set of windows, and these can be easily spotted in the Magnificat Chapel windows. Nativity — from the Otto F. Andrle windows of the Magnificat Chapel. 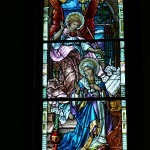 This article originally appeared in the Spring 2012 issue of The Stained Glass Quarterly. To download an Acrobat [pdf] version of the printed article, please click this link. The 103rd Annual Summer Conference of the Stained Glass Association of America was a homecoming for the organization, being held in part on the campus of the SGAA Headquarters and Stained Glass School. The event opened with two days of pre-Conference classes, with two painting workshops held in classroom space at the Stained Glass School, a design and a surface laminating class held in meeting rooms in the official Conference hotel, and a sand etching class held at Kathy Barnard’s studio in downtown Kansas City (see photos, page 110 and 111). Conference presentations began with Fred Shea giving an in-depth look at wood frames and the many issues they face. Jon Rarick of Reusché and Company of T.W.S., Inc., described the company’s line of enamels for glass painting; this was followed by a presentation by Philippe Valery on St. Just Glass. The First General Assembly saw lively discussion on the possibility of creating a Restoration Consultant certification or accreditation; it was decided to form a committee to further investigate this possibility and that the committee would report its findings and recommend a course of action in one year. The evening’s Welcome Reception and Banquet, sponsored by Wissmach Glass Company, was highlighted by a keynote address by Kathy Barnard entitled “The Art of Glass.” She presented some truly amazing work and some wonderful insights on the possibilities of glass art. Conference presentations hit a snag on Tuesday morning when the scheduled presenter for Facebook Marketing did not arrive. We found out later that day that he had been in a car accident on his way to the presentation when he called from the hospital to apologize for his absence. Member Laura Parham stepped in and described her efforts to advance the Stained Glass Association of America’s Facebook page, as well as successful online marketing in general. Rolf Achilles, curator of the Smith Museum of Stained Glass Windows, spoke on the topic of Midwestern stained glass; artists C.Z. Lawrence and James Piercey talked on the topic of design comparison. The day’s presentations concluded with the SGAA’s Restoration Committee presenting the new Standards and Guidelines for the Preservation of Stained (and Leaded) Glass Windows. The entire publication has been reworked from the ground up to better suit the needs of today’s restoration projects, based on the latest understanding and developments in the field. Members at the Second General Assembly voted to hold the 2014 Conference at the Elms Hotel and Spa in Excelsior Springs, Missouri. The 2014 Conference will be created as an artist’s retreat, with small-class workshops and seminars throughout the event. The SGAA Casino Night was a new feature at this summer’s conference. The event featured casino-style gaming tables, including Craps, Roulette, Blackjack, and Texas Hold ’Em, all of which were run by SGAA members for SGAA members. The evening was designed to be a fun social event (see photos, page 112 – 115) as well as to raise money for Association projects. Chips won were redeemed for raffle tickets for some great prizes, highlighted by crates of glass donated by S.A. Bendheim and martini and wine glass sets, with glasses custom etched by Kathy Barnard. On Wednesday, members boarded busses for the short ride from the Conference hotel to the SGAA Headquarters/Stained Glass School campus for “The Art of Glass,” an open house to which the public was invited. The purpose of this event was to introduce the crafts of stained, decorative, and architectural art glass to the local community of which we are now a part. As the SGAA Stained Glass School projects continue forward, it will be important to partner with the local community, which will ultimately benefit everyone involved (see photos, page 116-117). Major League Improv provided a lively opening to the Annual Awards Banquet (photos opposite page). Congratulations go to Steve Sussman and Dennis Roberts, both newly elected members of the Board of Directors (photo above) and to Jennifer Banbury, who was awarded the 2012 President’s Award for her longtime (and continuing) service as the Association’s Recording Secretary. Next year’s Annual Summer Conference will be held in Indianapolis, Indiana. This three-part series on resolution requirements for digital images in publishing was written for The Stained Glass Quarterly.